1 ml of INTERFERin® is sufficient to perform 500-1000 transfections in 24-well plates. INTERFERin® provides very high silencing efficiency already at 1 nM siRNA and can be used in a wide variety of adherent and suspension cells. Using low concentration of siRNA avoids off-target effects, and its gentle mode of action ensure more robust data and excellent cell viability. Easy to use thanks to its compatibility with serum and antibiotics, INTERFERin® is also perfectly suited for transfection of miRNA and other oligonucleotides like pre-miRNA, mimic miRNA, antimiR…. Several publications show that transfecting low siRNA concentrations avoids off-target effects. Indeed, these unwanted non specific side-effects are observed when transfecting siRNA at high concentrations (1,2). Hence, the reliability of the experimental data can be increased by using as little siRNA as possible. This is why INTERFERin® has been specifically designed to provide high silencing efficiency using low siRNA concentrations. INTERFERin®-mediated delivery of 1 nM of a specific siRNA shows selective and highly efficient knockdown of gene expression, while a competitor (L2K) needs at least 10 nM siRNA to reach 50% silencing efficiency (Fig. 1). Fig. 1: INTERFERin® only requires 1 nM siRNA for efficient gene silencing. 3LL cells stably expressing firefly luciferase were transfected with an anti-Luc siRNA using INTERFERin® or competitor L2K according to the manufacturer’s recommendation. Luciferase expression was measured after 48 h using a conventional assay. No inhibition was observed with control siRNA. Amazingly, 50% silencing is still achieved at 10 pM siRNA (Fig. 2). Fig. 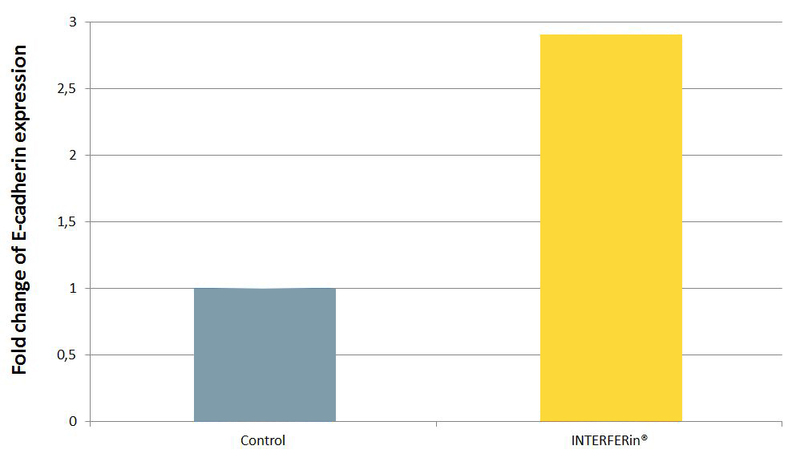 2: INTERFERin® is highly efficient even at extremely low siRNA concentration. A549-GL3Luc cells were transfected in the presence of serum with decreasing concentrations of an anti-Luc siRNA using INTERFERin®. Luciferase expression was measured after 48 h using a conventional assay. No inhibition was observed with control siRNA. Transfection of 1 nM siRNA targeting endogenous lamin A/C with INTERFERin® drastically reduces lamin gene expression to barely detectable level (Fig. 3). Fig. 3: Transfection of 1 nM siRNA with INTERFERin® results in efficient and specific gene silencing. CaSki cells were transfected with 1 nM lamin A/C siRNA using INTERFERin®. After 48 h, lamin A/C silencing efficiency was determined by immunofluorescence microscopy. 2. Caffrey, D. et al., (2011) PLoS One. 2011;6(7):e21503. Epub 2011 Jul 5. Transfection of microRNA (miRNA) oligonucleotides is increasingly being used to analyze biological effects of specific miRNAs on cell function. INTERFERin® is the reagent of choice for delivering miRNA, miRNA mimics or pre-miRNAs. INTERFERin® is the latest generation siRNA & miRNA transfection reagent, especially designed for high transfection efficiency in a wide variety of cells, resulting in high gene silencing or stimulation of gene expression. Indeed, some miRNA are also known to induce gene expression by association with the promoter of the gene of interest. 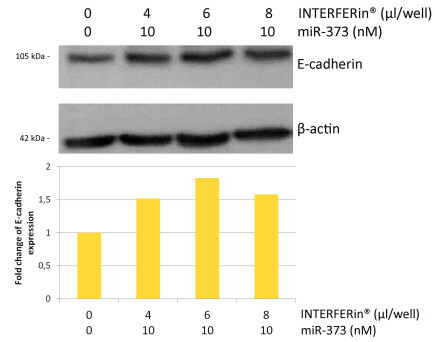 For example, INTERFERin®-mediated delivery of miR-373 leads to a 3 fold increase in E-Cadherin expression (Fig. 4). Fig. 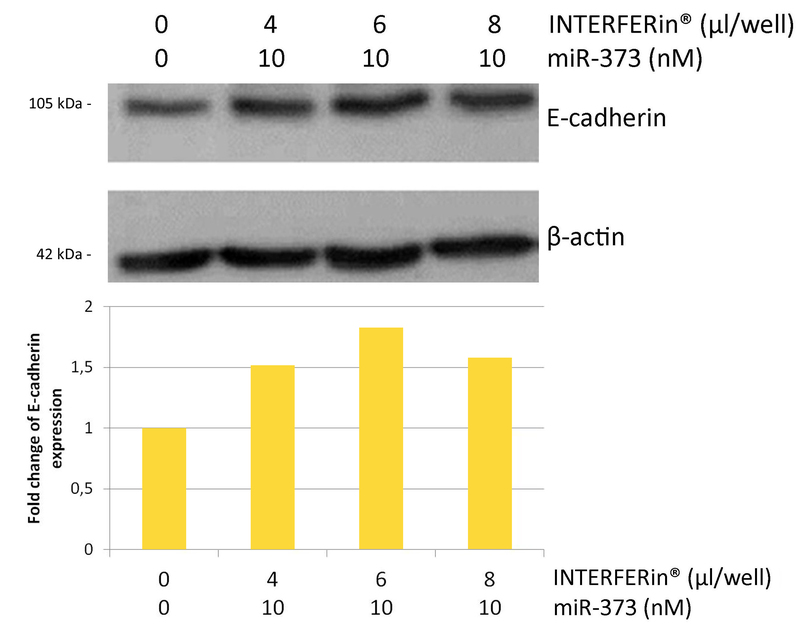 4: Transfection of miR-373 with INTERFERin® enhances E-cadherin expression. PC-3 cells were seeded in a 6-well plate and transfected with miR-373 (25 nM) using 8 µl per well of INTERFERin®. 72h after transfection, E-cadherin mRNA expression level was determined by RT-qPCR. The assay was normalized with the HPRT-1 gene expression. The cationic components of INTERFERin® require very little oligonucleotide amount, resulting in a gentle transfection process. In addition, the easy and robust protocol ensures reproducible results. Oligonucleotides like miRNA can be transfected with small quantities of INTERFERin® resulting in strong gene silencing or stimulation of gene expression. Whatever the concentration of INTERFERin® used, the effect stays approximately the same making INTERFERin® an economical reagent. For example, the fold change using different volume of INTERFERin® is always between 1.5 and 1.8 (Fig. 5). Fig. 5: INTERFERin® is already efficient at very low amounts. PC-3 cells were seeded in a 6-well plate and transfected with miR-373 (10 nM) using 4, 6 or 8 µl per well of INTERFERin®. 72h post-transfection, E-cadherin expression was analyzed by Western Blot. The assay was normalized using β-actin expression. The quantification was expressed by taking the control situation as reference. High transfection efficiency associated with high cell viability makes INTERFERin® the reagent of choice for generating relevant data for scientific publications. 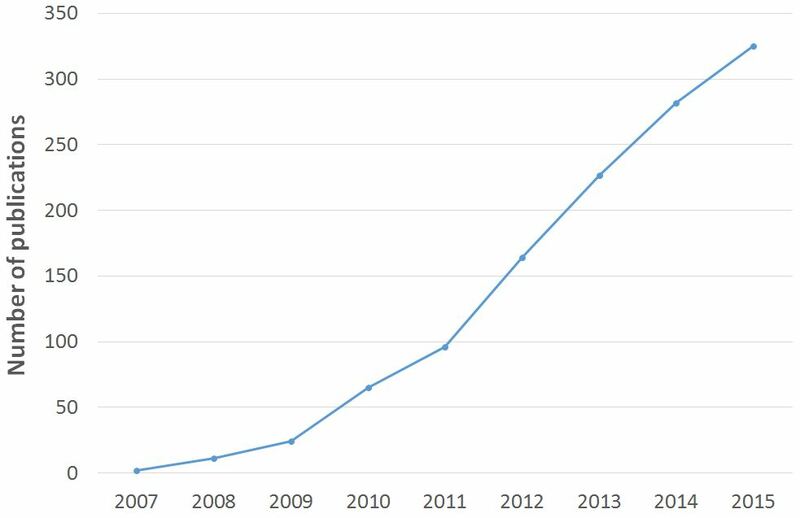 Indeed, the number of publications using INTERFERin® for miRNA and miRNA related molecules has been exponentially growing since its launch (Fig. 6). Fig. 6: INTERFERin® is involved in an increasing number of publication about miRNA transfection. For many adherent cell lines or primary cells, 1 nM siRNA is sufficient to obtain more than 90 % gene silencing. For suspension cell lines, 80 % silencing can still be reached by INTERFERin® using 5 nM siRNA (Table 1). Table 1: Successfully transfected cell lines and silencing efficiencies obtained with INTERFERin®. 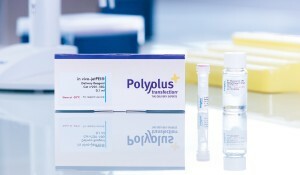 Specific conditions for various cell lines are available in our Polyplus-transfection Database. When it comes to cell viability, INTERFERin® outperforms other transfection reagents. 48 h after transfection with 1 nM siRNA, cells transfected with INTERFERin® appear healthy, while toxicity is clearly observed with reagent S (Fig. 7). Fig. 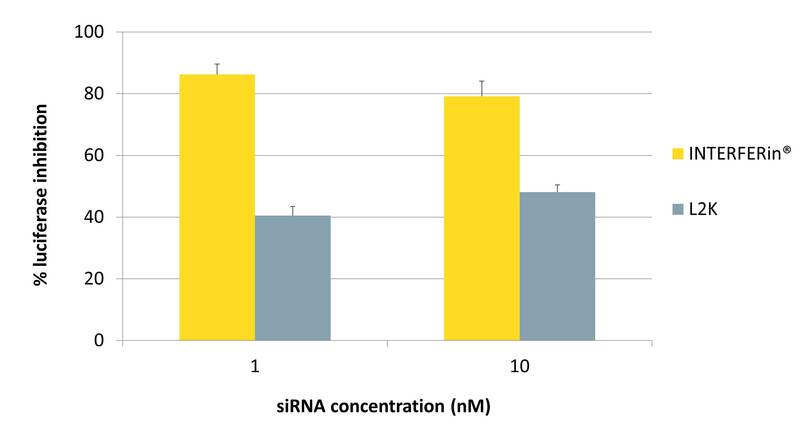 7: INTERFERin® is extremely gentle on cells, as shown in this comparison of cell morphology 48 h after siRNA transfection using INTERFERin® or competitor reagents. A549-GL3Luc cells were transfected in the presence of serum with 1 nM Luciferase siRNA using INTERFERin® or competitors S or H according to the manufacturer’s protocol. INTERFERin® is ready to use and the protocol is straightforward. A starting concentration of 1 nM siRNA ensures silencing of most genes in most cell types (Fig. 8). INTERFERin® is compatible with both serum and antibiotics, hence avoiding any time consuming washes and medium changes; furthermore INTERFERin® can be left on the cells without any adverse effects. Take a look at our Expert Tips in Genetic Engineering and Biotechnology News . 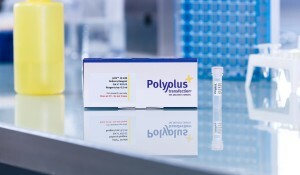 If you have any questions regarding INTERFERin®, please visit our dedicated Frequently asked questions or contact us at support@polyplus-transfection.com. 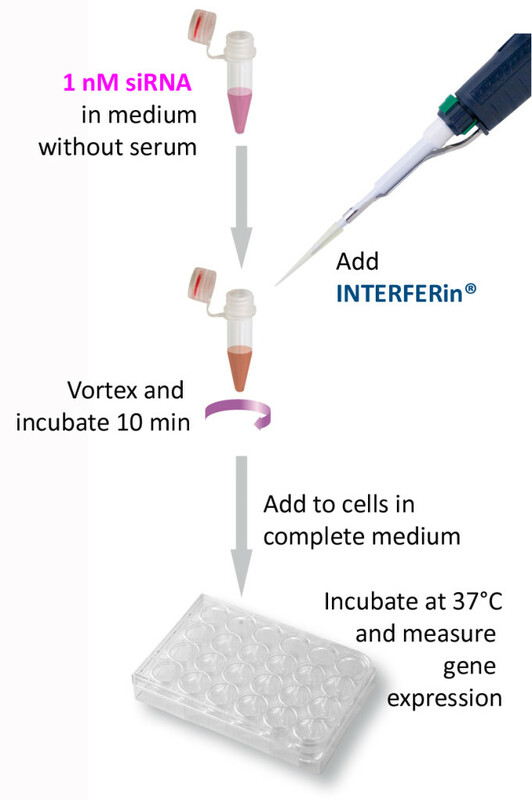 Our INTERFERin® reagent is perfectly suited to perform RNA interference experiments, which correspond to the specific inhibition of gene expression promoted by siRNA. siRNAs are gene specific complementary double-stranded RNA oligonucleotides present in the cytoplasm of plants, worms and mammalian cells, and can be efficiently transfected into cells with INTERFERin®. 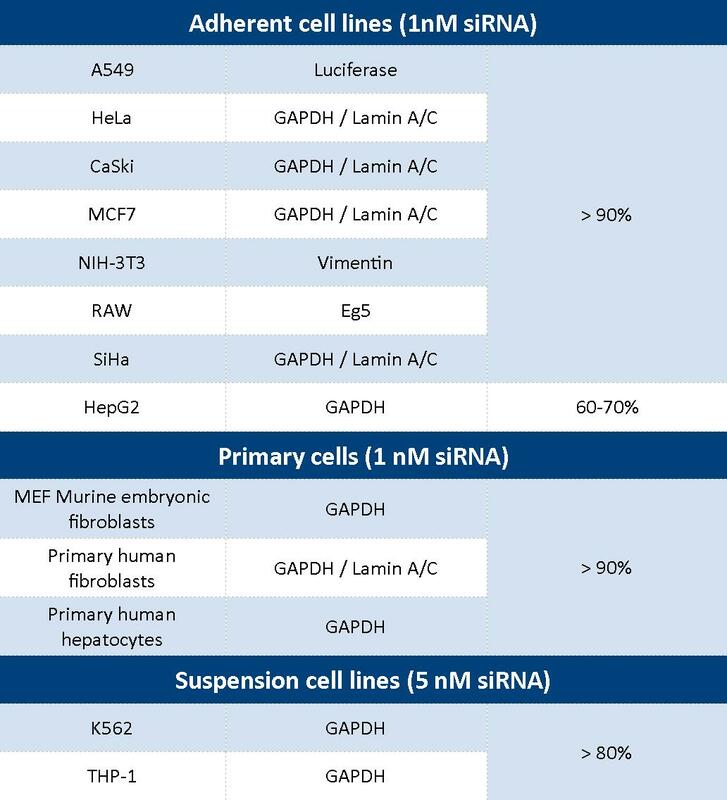 Here is a selection of relevant references using INTERFERin®, more are available in our Polyplus-transfection Database. Carduner, L., Picot, C. R., Leroy-Dudal, J., Blay, L., Kellouche, S., Carreiras, F. (2014). Cell cycle arrest or survival signaling through alphav integrins, activation of PKC and ERK1/2 lead to anoikis resistance of ovarian cancer spheroids., Exp Cell Res 320, 329-4. Hu, B., Castillo, E., Harewood, L., Ostano, P., Reymond, A., Dummer, R., Raffoul, W., Hoetzenecker, W., Hofbauer, G. F., Dotto, G. P. (2012).Multifocal epithelial tumors and field cancerization from loss of mesenchymal CSL signaling., Cell 149, 1207. Lai, L., Song, Y., Liu, Y., Chen, Q., Han, Q., Chen, W., Pan, T., Zhang, Y., Cao, X., Wang, Q. (2013). MicroRNA-92a negatively regulates Toll-like receptor (TLR)-triggered inflammatory response in macrophages by targeting MKK4 kinase., J Biol Chem 288, 7956. Nilsson, R., Jain, M., Madhusudhan, N., Sheppard, N. G., Strittmatter, L., Kampf, C., Huang, J., Asplund, A., Mootha, V. K. (2014). Metabolic enzyme expression highlights a key role for MTHFD2 and the mitochondrial folate pathway in cancer., Nat Commun 5, 3128. Qin, W., Shi, Y., Zhao, B., Yao, C., Jin, L., Ma, J., Jin, Y. (2010). MiR-24 regulates apoptosis by targeting the open reading frame (ORF) region of FAF1 in cancer cells., PLoS One 5, e9429. Every batch of INTERFERin® is tested in house in a transfection assay on A549-Luc cells, constitutively expressing the Luciferase gene. The silencing efficiency obtained using 1 nM siRNA and INTERFERin® for each batch is indicated on the Certificate of Analysis.